How much would it cost to build a Star Destroyer? A (very expensive) Star Destroyer. The Imperial I-Class Star Destroyer in Star Wars is 1,600 meters long. If you look at this picture, you can see that the height and width of the main pyramid section is approximately 220 meters by 900 meters. Hence the internal volume of the Star Destroyer is approximately a pyramid with base 1/3 x (1/2 x 220 x 900) x 1,600 = 1/3 x 99,000 x 1,600 = 52.8 million cubic meters. We’ll ignore the control tower and other details. For comparison, the world’s largest building by volume, the Boeing Everett factory, is 13.3 million cubic meters. So it’s big, but not so big that we would run out of raw materials. Our first reference point is the world’s largest cruise liner, the Allure of the Seas. Ships are a good analogy because they need to be light and strong to transport lots of stuff fuel-efficiently. The Allure of the Seas is 360 meters long, 60.5 meters at maximum width (47 meters at waterline), and 81.3 meters at maxmium overall height. It weighs 100 million kilograms. If you look at a picture of the ship and consider that cruise liners are fairly boxy, we can approximate its volume as 360 x 55 x 60 = 1.188 million cubic meters. Hence the Imperial Star Destroyer is approximately 44.4 times the volume of the Allure of the Seas. Thus we can estimate its weight as 44.4 x 100 million = 4.44 billion kilograms. Our second reference point is the Gerald R. Ford–class aircraft carrier of the U.S. Navy. Conveniently, it weighs about the same as the Allure of the Seas and is of a similar size and volume. It has two nuclear reactors and costs about $10.44 billion. Each ship generates about 3.3 GW of electrity (enough to power continuously nearly three time-travelling DeLoreans from Back to the Future), i.e., 146.5 GW overall. For comparison, the whole world produced 23.5 million GWh of electrical energy in 2014, which works out to 2,687 GWh continously (i.e., enough power to run 18.3 Star Destroyers). For a sanity check, we can use the International Space Station. The ISS weighs 0.45 million kilograms, and I guesstimate an approximate total volume of 2,000 cubic meters (internal pressurized volume is 916 cubic meters). Scaled up to Star Destroyer volume, this would give it a weight of 11.9 billion kilograms. This tells us that the Star Destroyer based on a ship is actually quite light, which makes sense since it has many large internal cavities to hold spaceships etc. We have seen that the Imperial Star Destroyer is 44.4 times the $10.44 billion aircraft carrier, so the value of the base ship is about $464 billion. This will get you something that looks like a Star Destroyer with the power and lights on but doesn’t do anything yet. We need to add weapons ($12 billion), engines ($140 billion) and TIE fighters and AT-ATs ($20 billion). Total cost: $636 billion. We are told that the Star Destroyer has 60 turbolaser turrets and 60 ion cannons. The ATHENA laser is the closest thing that exists right now. It will be rated to 60 kW at a cost of $25 million for a demonstrator, which is enough to disable a car. The technology is expected to work up to 500 kW, which should be enough to disable planes and trucks. Let’s guess that, due to volume production efficiencies, we can also get the final 500 kW version for $25 million each. Each turret will need four lasers, for $100 million per turret. We don’t have an equivalent ion cannon, so we will make do with 120 laser turrets for a total of $12 billion. The most powerful ion thruster prototype, NASA Evolutionary Ion Thruster (NEXT) has a power rating of 7 kW and thrust of 0.25 N. How many NEXTs can we power using the Star Destroyer? Let’s say we use 98 GW out of the 146.5 GW available power, so two-thirds of the ship’s total power budget. This means we can run 14 million NEXTs with a combined total thrust of 3.5 million N. This will accelerate the ship at 0.8 mm/s². This is not much, but enough to get going: from a standing start, the ship would be moving at 2.9 m/s after one hour and 68.7 m/s after one day. The rated speed of the Star Destroyer is only 270 m/s (972 km/h), which we would reach after nearly four days. If each NEXT weighs 100 kilograms including support material, their total weight will be 1.4 billion kilograms—around one-third of the total weight of the ship. The cost of the NEXT is unknown, but the principle is very cheap to demonstrate. Let’s guess that it costs $10,000 per thruster, for a total of $140 billion. TIE fighters also run using ion engines, but we’ve seen that our current NEXT technology is woefully inadequate for high acceleration. So we will just assume that each one costs the same as a Lockheed Martin F-22 Raptor at $150 million per piece (yes, it won’t work in space but never mind). 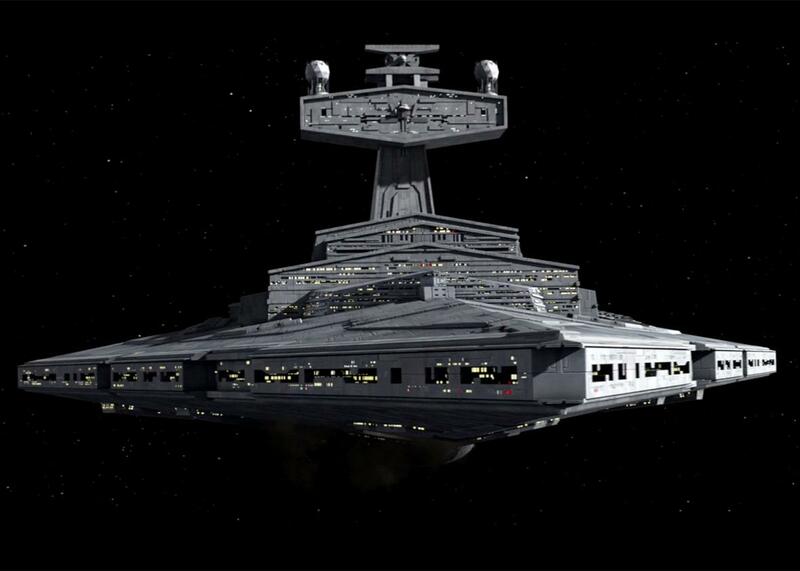 The Star Destroyer has 72 of them, for a total cost of $10.8 billion. There is also a similar number of shuttles, heavy troop transports, AT-AT walkers, etc. Let’s just round it up to $20 billion for the lot. How much does it cost to get the Imperial Star Destroyer into space? The Falcon Heavy from SpaceX, currently the cheapest and largest commercial rocket able to launch payloads toward Mars (the minimum respectable target for any Star Destroyer), costs $135 million to launch 13,200 kilograms toward Mars. Let’s say we get a small discount and pay $10,000 per kilogram. So getting the Star Destroyer parts into space will cost $44.4 trillion and require 330,000 launches! That is one launch every minute for nearly eight months—the peak operating rate of a very busy 24-hour airport. If that launch contract was ever awarded, I’d want to be Elon Musk even more than I already do. In the animated TV series Space Battleship Yamato (Star Blazers), the sunken World War II Japanese battleship Yamato is raised and converted into a spaceship before embarking on a world-saving quest. Would our Imperial Star Destroyer really work? Probably not for long. Getting rid of all of that excess heat from the 88 nuclear reactors is a problem that we have not yet solved. The ship would quickly get so hot that it would melt or explode—or both. You could try to channel the excess heat into a Tokamak, but then we are getting into technologies that we don’t know (yet) how to build properly. A lot of really big fins could also be used to radiate the excess heat into space, but that’s too much work to calculate at this point. If the air in the ship is pressurized to sea level equivalent, that 52.8 million cubic meters of air is going to weigh about 65 million kilograms. That’s an extra 4,925 SpaceX Falcon Heavy launches just to fill it up with air. Science Fiction Movies: How much money has been spent attempting to bring Matt Damon back from distant places? Star Wars: The Force Awakens: Do I need to watch previous Star Wars films to watch Star Wars: The Force Awakens? Hypothetical Scenarios: If a type 3 civilization existed, what would they be using all of the energy for?